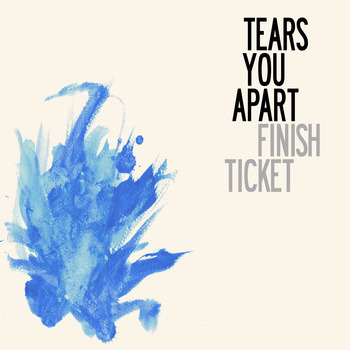 Finish Ticket’s new album, “Tears You Apart” was released on February 26, but tonight is their album release party at Rickshaw Stop in San Francisco. 1. “Numb” : Very mysterious. Amazing intro to the album. Chorus will be a big singalong live. Drum and bass groove is excellent. Guitar sounds dirty! 2. “Doctor” : Another melancholy verse and building pre chorus before another big singalong. These brehs know how to do a chorus. Is every song a single? 3. “Catch You On My Way Out” : Second favorite song. First time I heard this live I was blown away. The recording really captures both a raw feeling and big atmosphere. 4. “In The Summer” : Summer song of 2013. Evokes such familiar and nostalgic feelings. Awesome basslines. Varied vocal melody in bridge makes it a perfect song. 5. “Naïvé-tea" : They’ve gone into outer space. Brian Graves could live in this transitional song. 6. “Lying Through Our Teeth” : This song could be on the soundtrack of a space western. Such a spooky melody and gang vox. They pull off this new direction so well. 7. “Tranquilize” : Huge drum and vocal sound. Sad and uplifting at the same time. Another one for the space western soundtrack. Could be another single. 9. “Killing Me” : Very impressed that they can have so many different sounds. The perfect song for wandering around on a warm day. Yet another single! 10. “Bring the Rain” : Guitar sounds are so interesting. Great use of dynamics from everyone in this song. The bridge is beautiful. 11. “Take It Out” : Perfect final track. This is the song every album needs to go out to. It makes you want to hit repeat and let the whole album play again. Overall, “Tears You Apart” is an incredible release, not only for a local favorite. Any band would be proud to have written and recorded this album. (Oh yeah, my favorite song was track 4. 140 characters is not enough!) Listen to the album and buy it here. Finish Ticket’s album release show is tonight at The Rickshaw Stop in San Francisco. Also performing is our very own Nik Bartunek with an opening solo set, the new group holychild and our favorite vampires of Ghost & The City. The show starts at 10:00pm. More info can be found here.